I think I may have temporarily lost my mind in Florence. I had never been in a Celine shop before. Last summer I tried to go to the one and only one uptown but it wasn't there. The address listed had been converted into something else. When we left for Italy, I told JD that should we find a Celine shop, it will be trouble. and low and behold there was a shop right there in Florence on Via Tornabouni. The next day we tried to find it but walked in the opposite direction. The following day we found it around noon after visiting the Duomo. A group of ladies were huddled around the counter when we walked in. Four white dust bags sat on the counter next to a black mini luggage bag. One of them was on the phone with a friend who desperately wanted it. the chance to put them out on the showroom floor yet. Then he unwrapped the rest of them and moved them to a table. when I turned around and noticed the bright poppy colored bag. Naturally, I spent the next 30 minutes debating what to do. The bag is quite large for me, and the color is so bold. It would be a big statement. I decided to take the opportunity and get the bag. The rest of the day was spent asking myself if I was some kind of idiot. This Saturday was the first day I took it out. An awful, cloudy and cold day in New York. than with one of my favorite colors, poppy red. First let me say that I was unaware of the hype surrounding this purse. I first saw it on a blog in a brown color and thought it was cute. That was the extent of my knowledge. Scowls and stunned looks followed me through the afternoon. One woman even stopped while crossing the street to turn around and gawk at it. It wasn't until our very last stop that I understood why. 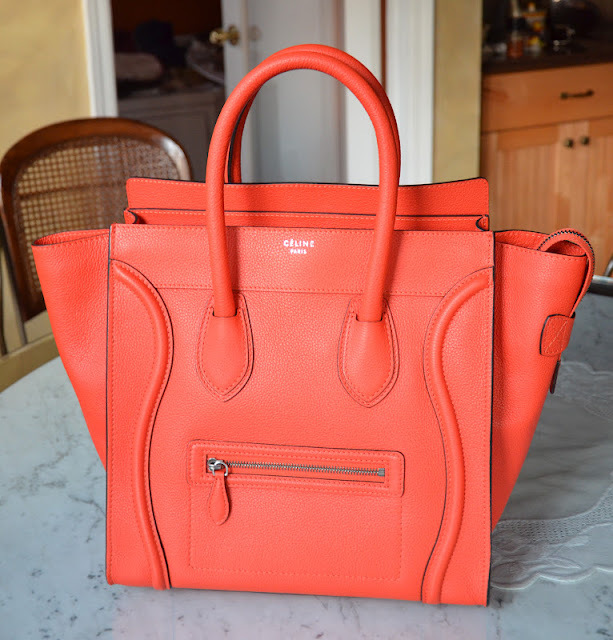 A man working in the shop we were in ran over to me to ask if it really was the red Celine bag. and referred to it as liquid gold hanging from my arm. So here it is, my very first Celine bag. it looks a little orange in this light but it's much more red in person! that it might look a bit ridiculous. ahhh im trying not to be jealous right now. it's apparently not working!! found this post through the "you might like" on today's post and just love it. i always loved that handbag when you would post pictures with it but i love it even more now that it has a great story behind it. how cool that you were able to be one of the only people with it here! Oh my word. The "you might like" buttom led me here and boy was it right. This is too perfect. I've seen this bag all over the web (if only I had seen it all over in person) and have obviously been drooling over it from a distance. Bravo to you and your "impulse" purchase! I fully believe that statement colors can double as neutrals. SO true with this bag!